The latest blockbuster musical to land in Melbourne takes the form of a flying English nanny complete with magic carpet bag and a spoonful of sugar to help the medicine go down. That's right MARY POPPINS is in town and Accor hotels are offering 'supercalifragilistic' Stay & See packages from 30 July to suit all tastes and budgets - so make your booking 'spit, spot' before you miss out! 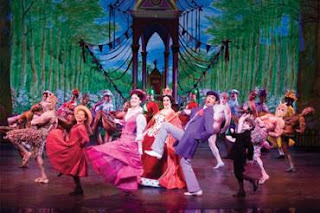 Take the kids or grandkids – or embrace your inner child - and enjoy a 'jolly holiday' this winter to Melbourne's Her Majesty's Theatre where Mary Poppins turns the orderly world of the Banks family upside down with Bert the chimney sweep and a cast of characters in tow. Newcomer Verity Hunt-Ballard plays Mary Poppins alongside So you think you can dance? judge Matt Lee as Bert and the legendary Philip Quast and Marina Prior as George and Winifred Banks. Brilliantly adapted from the beloved books by Australia's own P.L.Travers and the classic 1964 Walt Disney film, MARY POPPINS will open at Her Majesty's Theatre Melbourne in July 2010, produced by world renowned Disney Theatrical and Cameron Mackintosh productions.